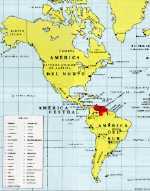 Venezuela is located in the American continent, at the northern part of South America, between latitudes 0°38'53" (Birth of the Arari river in the Amazons state) and 12°11'46" (Cabo San Román - Falcón state) or 15°40'33" (Isla Aves - Territorios Insulares) longitudes 58°10'00" (Western part of the Esequibo river in the Guayana Esequiba) and 73°25'00" (Birth of Río Intermedio - Zulia state). It has borders with Colombia to the West, Brazil to the South and Guyana to the East. To the North of the country is the Caribbean sea. Then national flag was created by Francisco de Miranda, who used it in its first expedition, when trying to make Venezuela independent from Spain in the early 1800's. Many say that yellow symbolizes the gold of the country; blue the sea that separates us from Spain and red for the blood that made us independent. The seven stars, correspond to the seven provinces that the country used to have when it became independent. Venezuela has a territory of 916.445 km², and is divided in 23 states and a Federal District. Venezuela has a population of 23.4 million inhabitants (2000) of whom 85% lives in cities. This population is very young: 37% is less than 15 years old and 65% less than 30 years old. The growth of the population is very strong with a birth rate of 25.7 per one thousand, and a low mortality of 25.7 per one thousand. 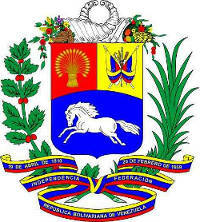 It is estimated that in the year 2000, Venezuela has 24 million inhabitants and in year 2010, 29 million. As a result, population doubles each 33 years. Venezuela is a country of immigrants. As a matter of fact, only 2% of its population is Indian (native). The predominant ethnic group is the "mestizo" (mixture of European, African and Indian), and constitutes 69% of the population. Whites count for 20% and black for 9%. Since 1948, with the oil boom, there was an estimated of one million inmigrants from Spain, Italy and Portugal. Also a great number of Colombian arrived. Starting in 1958, a great number of Venezuelans moved from the country side to the city, and where replaced by Colombians. There was also a great professional immigration from Argentina, Chile and Uruguay, where the economic and political situation was not favorable. Later, the immigration - less prepared - from Colombia, Ecuador and Peru, continued with an estimated number of 2 million. The Indian population is quite small, and is found mainly in the Guayana region and the Goajira peninsula, west of Lake Maracaibo. Main cities (1990): Caracas 1,822,465; Maracaibo 1,249,670; Valencia 903,621; Barquisimeto 625,450; Ciudad Guayana 453,047. Venezuelan constitution is very recent. 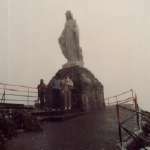 It was prepared in 1999 and ratified by a national referendum in December 1999, with close to 70% of the votes. It specifies that government has 5 powers: the traditional: Legislative, Judiciary and Executive, and also the electoral and moral powers. Elections for the presidency and for the congress are popular and realized each 6 years. Congress is unicameral. Executive power is in hands of a president (who is also the chief commander of the armed forces), and who names the vice-president, a new figure in the 1999 constitution. President can be reelected for another 6 year period. The main traditional parties Accion Democratica and Copei, virtually disappeared in 1998 giving place to president's Chavez' Movimiento V Republica, and supported by Movimiento al socialismo (Movement towards socialism) and Patria para Todos (links in Spanish). Each state is headed by a governor who gets elected in popular elections. 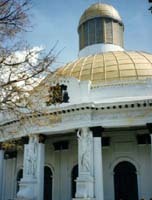 Each state has its own Legislative Chamber. Main religion is catholic (92.1%). Freedom of choice is warranted by constitution. Venezuela was discovered by Columbus in his third voyage in 1498. Independence started in 1810 and ended with the Carabobo battle in 1821, under the command of Simon Bolivar (The liberator) who died in 1830. From 1930 to 1958 there was a succession of constitutions, elected and non-elected presidents, until the democratic period which dates from 1958. 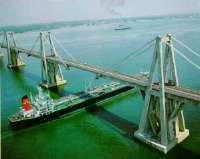 The most important industry in Venezuela is Oil. Up to 1970, Venezuela was the world's major exporter. It also has other minerals. Primary education in Venezuela is free and compulsory, however, private schools play a very important role and complement public schools. A very well renowned institution is the Instituto de Estudios Superiores de Administración IESA, with management graduate studies and is one of the countries main "think tank". Telephones (main lines; 1998): 2,600,000 (1 per 10 persons). Venezuela has a great variety of food. For more details, click here (Spanish).